The weather in the UK is glorious. Over the weekend, we spend time in the garden, but we did more ducking in and out due to the intensity of the heat. The weather was designed more for those wishing to sit out and sip on something cool, than us gardeners digging the earth and weeding, but I must not grumble. It finally feels like Junes weather has arrived in style captured wonderfully in this postcard photograph. I love this picture taken my husband and the red roses too. 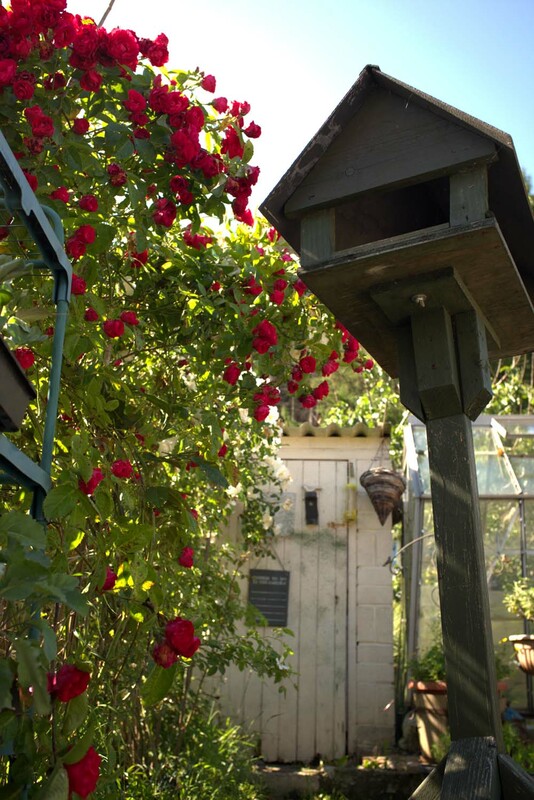 This is leading up our garden path, and I do mean upwards! 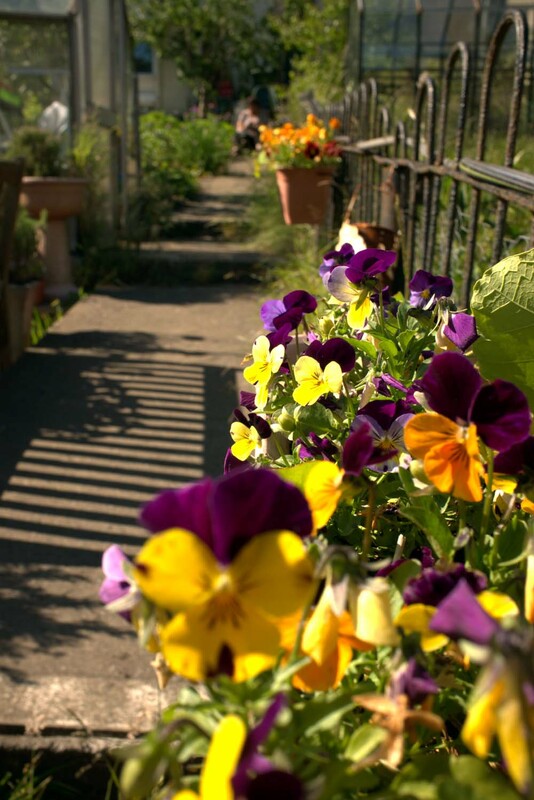 I have some hanging pots on the side fence filled with colourful violas and pansies, not just for colour but also because they are edible and adorn many a dish from sweet to savoury. I also have some nasturtium in the garden plot. I think next week we will see some a spectrum of orange shades tumbling down the path. 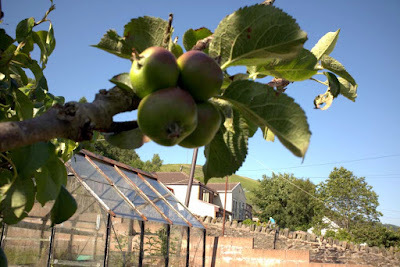 We may actually get some apples from the tree this year. We have been living here for nearly 3 years and its not given us anything, probably still won't if we get a strong gust of wind knocking those hanging on off - lets wait. I think these are cooking apples, but I won't be able to confirm that until we get to eat one. 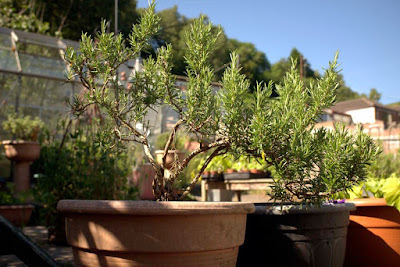 Loving the wayward nature of this Rosemary herb bush that looks more like a Bonsai shrub. 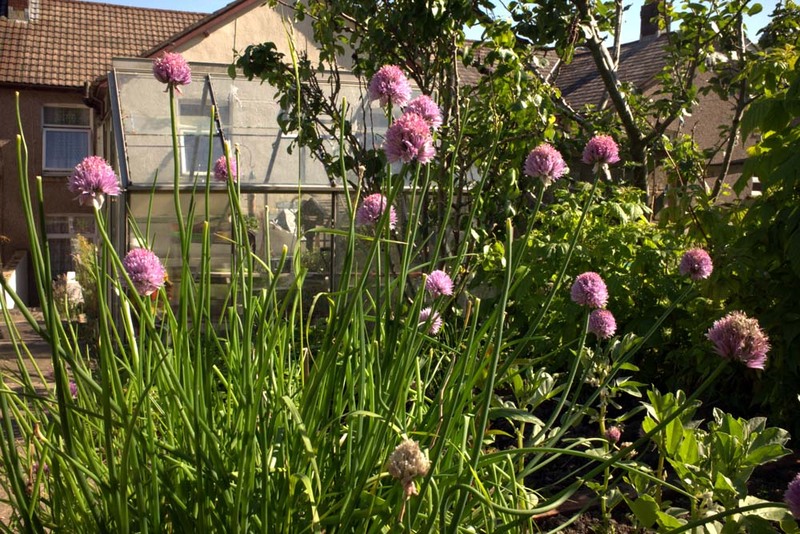 Plenty of chive flower heads, the bees have been loving it. 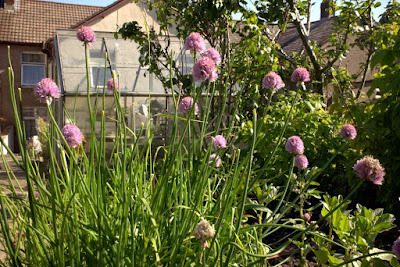 I have used lots of chives in new potato and pasta salad dishes. 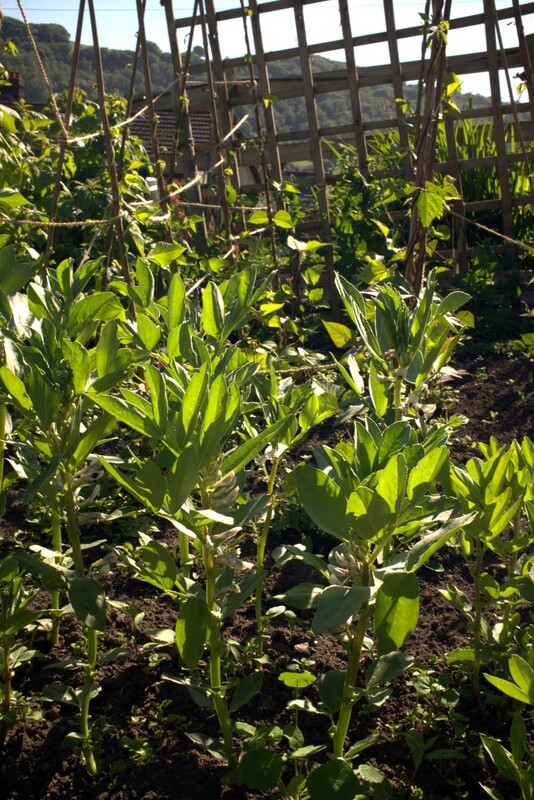 Our broad bean plants are coming along, lots of flowering - no pods yet. 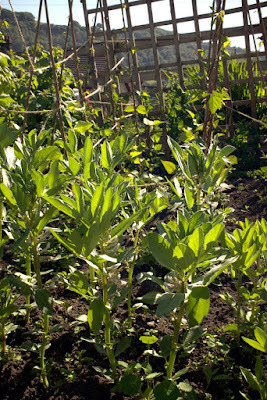 Behind the broad beans are the wigwam canes with various climbing beans, some of which have begun to flower too; and on the trellis we have some peas...also yet to flower. 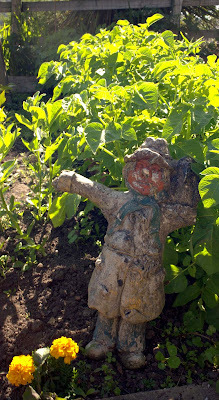 Behind the scarecrow we have potatoes. We will harvest these in late July as we were a little late getting them into the ground. 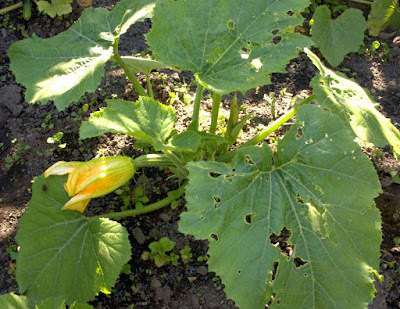 Courgettes are beginning to come along, I reckon this time next week I have harvested the first of many. 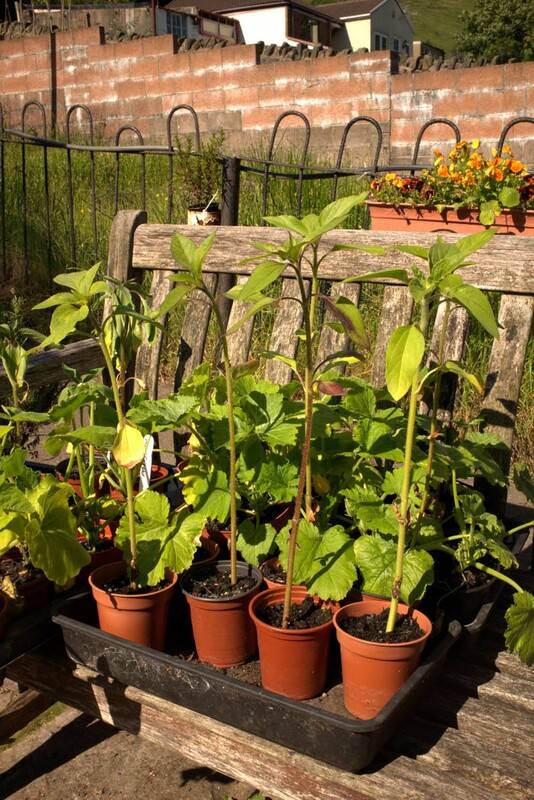 I have some sunflowers to go into the ground and they went in yesterday. I am hoping to show off some proper harvest next week, but this week all I have are some homegrown strawberries. I am sharing this with Harvest Monday hosted by Dave over Our Happy Acres. 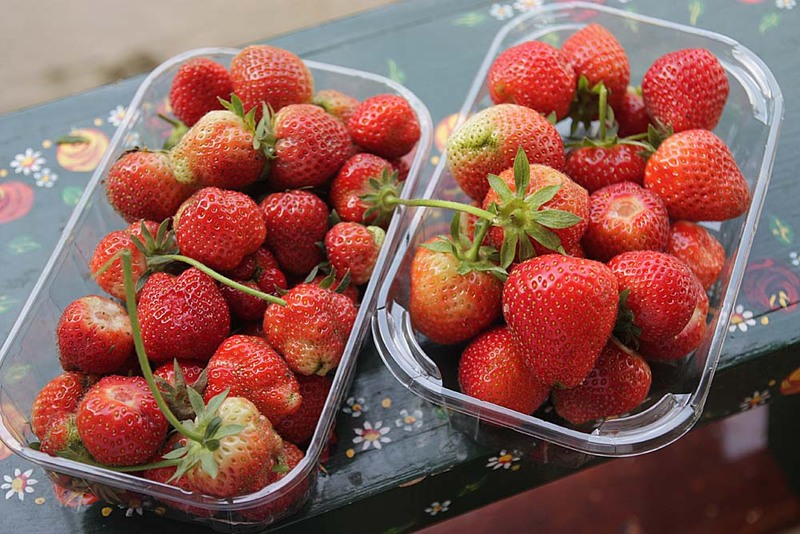 Your pictures are lovely and those strawberries are very impressive! My raspberry bushes have their first fruit of the season but definitely not enough to fill a punnet. I confess that I am ready for a cool change already but do appreciate the sunshine and it very much feels like summer is here. Thank you Kari. Just harvested another handful! I am hoping to make Rhubarb and Strawberry Crumble or the US version. My raspberry bushes have some buds but nowhere ready yet. Yes, I agree it feels very summery, i actually feel like I am overseas when I am in the garden, esp when I get a waft of someone BBQing. 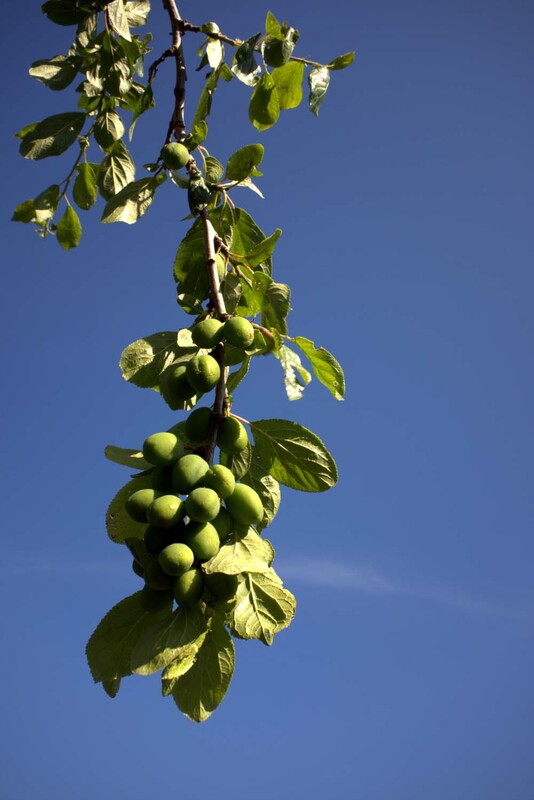 Love seeing the fruit trees! My beans are just beginning to flower too. The flowers are so pretty! I love pansies, and nasturtiums too for that matter, they're so pretty and useful. That rosemary does look like a bonsai! 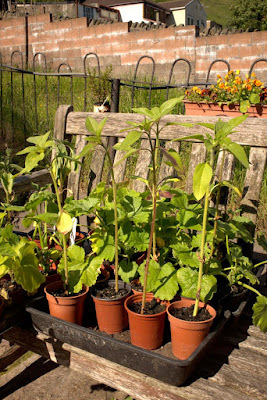 No sunflowers for us this year as the slugs devastated the seedlings in the cold frame. What a shame Sue. I protected mine this year, last year the slugs got them, so I was a bit wiser this year. It is hot, ridiculously so - we are so not used to it in the UK. I close my eyes and I feel like I am overseas esp when i get a waft of BBQ smell floating in the still air . Yes indeed we do have some interesting weather in the UK - four seasons in one day is possible. Ah 'brain fog yes i suffer from that these days too. Wow, those strawberries look so good, and I love all of your flowers, too! Thank you e. I am loving the array of colours in the garden, more than just green now. Oh wow, your plum tree is loaded and it looks like you'll be courgettes soon. I think strawberries taste better when they're warmed by the sun. And I envy your sunflowers, none of ours came up even though there were sown indoors. I wouldn't go as far as describing my skills in the garden as 'prowess' :) but I am making more of an effort once again after many years of dipping into a lull. I am quite pleased at where we are this year wih the garden plot and this is a sign that it will get better from now on. Lovely to make your acquaintance Kathryn through HM.